Take a little DNA from a Chinook salmon, and a little growth hormone from an eel-like creature called an ocean pout, and what do you get? A frankenfish that grows twice as fast as wild salmon – and just as rapidly grows the profits of a biotech company called AquaBounty Technologies. In a last-minute holiday gift to yet another biotech company that wants to play god with our food, the Obama administration has cleared the way for the FDA to soon approve the first genetically modified salmon. 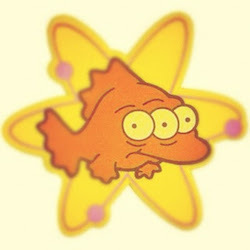 Bad idea, says the Consumers Union, the advocacy and policy arm of Consumer Reports, which called the Environmental Assessment (EA) of the proposed frankenfish "flawed and inadequate." 1. Harmful to human health: FDA has allowed this fish to move forward based on tests of allergenicity of only six engineered fish—tests that actually did show an increase in allergy-causing potential, according to Michael Hansen, PhD, Senior Scientist with Consumers Union. 2. Harmful to wild salmon population: Only 95% of the GE salmon may be sterile, and the rest fertile. Even 1% equals thousands of fish. Plus the fish at the egg production facility in Prince Edward Island, Canada, will not be sterile. All it takes is for some of these frankenfish to escape, and the world’s wild salmon population will be at risk. 3. Not Labeled: Without GMO labeling laws, you’ll have no way to avoid the frankenfish that will end up in grocery stores and fish markets. It’s going to take hundreds of thousands of us telling the FDA “NO FRANKENFISH” in order to have an impact. Please make your voice heard today! 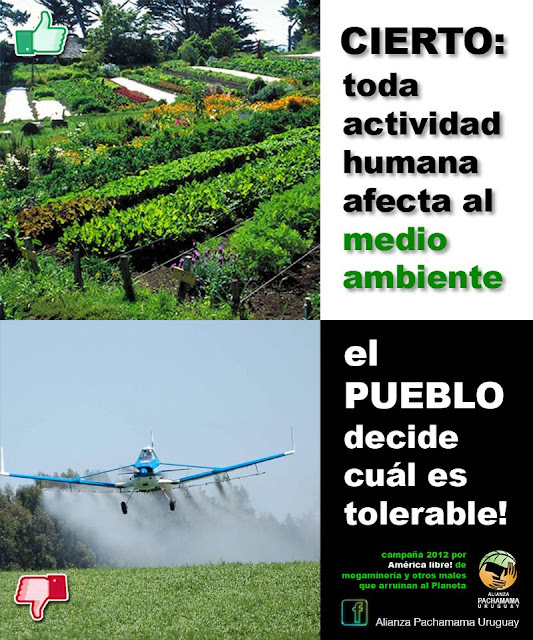 Todas las actividades humanas afectan el ambiente, pero no todas dan igual. There's an age-old tradition in Washington of making unpopular announcements when no one's listening—like, you know, the days leading up to Thanksgiving. That's when the Obama administration sneaked a tasty dish to the genetically modified seed/pesticide industry. This treat involves the unceremonious end of the Department of Justice's antitrust investigation into possible anticompetitive practices in the US seed market, which it had begun in January 2010. It's not hard to see why DOJ would take a look. For the the crops that cover the bulk of US farmland like corn, soy, and cotton, the seed trade is essentially dominated by five companies: Monsanto, DuPont, Syngenta, Bayer, and Dow. And a single company, Monsanto, supplies nearly all genetically modified traits now so commonly used in those crops, which it licenses to its rivals for sale in their own seeds. La Red por una America Latina Libre de Transgénicos, RALLT, lamenta las declaraciones efectuadas por los representantes de los Ministerios de Agricultura de los países del Cono Sur sobre fortalecer el desarrollo de los transgénicos en la Región. Cinco 5 países del Consejo Agropecuario del Sur (CAS), Argentina, Brasil, Chile, Uruguay y Paraguay, en su 24 Reunión Ordinaria que se efectuó en Punta del Este, Uruguay, el 30 octubre de 2012, acordaron aunar criterios sobre el desarrollo agrícola de este bloque, entre ellos fortalecer los marcos regulatorios sobre organismos transgénicos en estos países, robustecer el dialogo y las capacidades de negociaciones en el Protocolo de Bioseguridad y buscar posiciones comunes. El CAS agrupa a los Ministros del ramo desde 2003 para la articulación del sistema agropecuario de la Región y la coordinación de acciones en políticas públicas para el sector. Los miembros del CAS acordaron además fortalecer las relaciones con el grupo North American Biotechnology Initiative (NABI) dedicado a promover transgénicos en EE.UU., Canadá y México y establecer políticas de alto nivel en biotecnología. En su declaración el CAS señala que los organismos genéticamente modificados (OGMs) presentan una herramienta posible para apoyar a la región en el desafío de incrementar la producción de alimentos, adaptarse a los retos que plantea el cambio climático y mitigar los efectos de la agricultura sobre los recursos naturales, entre otros. 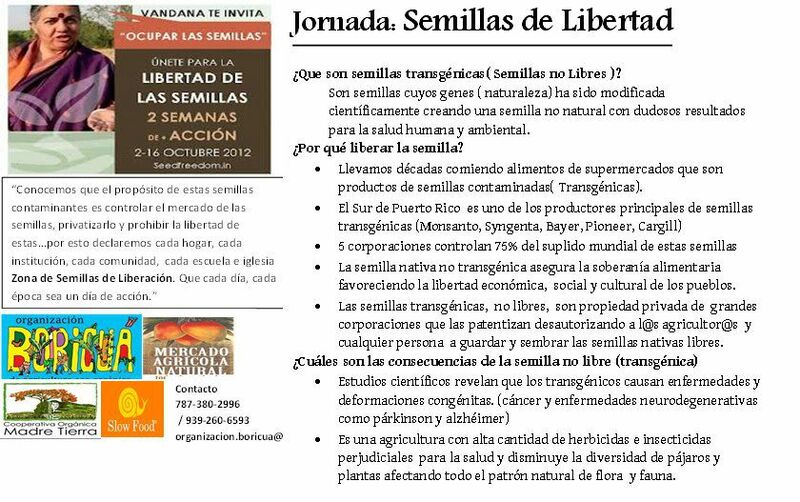 Sabemos que los OGMs no están diseñados para aumentar la producción ni para rendir mas, están diseñados para resistir los herbicidas que las mismas empresas producen para facilitarles la venta de sus semillas patentadas y químicos tóxicos al medio ambiente y la salud humana. Entendemos que la alimentación del Cono Sur del continente no depende de los cultivos transgénicos, sino de la conservación de su patrimonio de semillas adaptadas a las condiciones locales que nos darán un resguardo seguro para el cambio climático y del fomento de los cultivos orgánicos. Además los OGMs han causado graves daños a los recursos naturales de los países miembros del CAS. Se ha reportado contaminación de maíz en Chile, Uruguay y Brasil, aumento de uso de herbicidas y plaguicidas con graves daños a la salud humana en poblaciones rurales en Argentina y Paraguay por causa de las fumigaciones aéreas, desmonte de bosque nativo en Argentina para aumentar los cultivos de soya, estan entre los impactos mas serios que estos organismos han causado en la región. Por esto invitamos a los miembros del CAS a conocer estos impactos y adoptar acciones aunadas que protejan a sus ciudadanos y no a las transnacionales de semillas biotecnológicas. La RALLT ha detectado en su publicación reciente sobre la Transgénesis del Continente de America Latina, que existe una falta de regulaciones adecuadas de los organismos transgénicos en todos los países de America Latina. 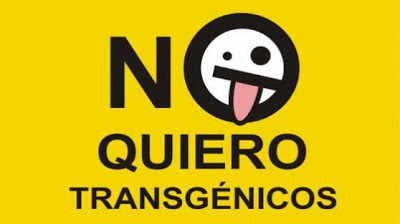 Tres países miembros del CAS, Chile, Uruguay y Argentina, no son aun miembros del Protocolo de Bioseguridad, convenio que apoya la regulación internacional de los organismos transgénicos. Por esto es peculiar que el Consejo acuerde adoptar posiciones comunes en un convenio que se han negado a firmar la mitad de sus miembros. Es además preocupante que acuerden estrechar lazos con el NABI cuyos países han fomentado históricamente los transgénicos y donde EE.UU. aun no acepta regulación internacional alguna sobre sus OGMs ya que no es miembro del Protocolo. Más aun, EE.UU., Canadá, Chile, Uruguay, Argentina y Australia conformaron el Grupo de Miami para estorbar el surgimiento de este Protocolo de Bioseguridad, en el año 2000. Por esto la RALLT permanecerá atenta a las posiciones que estos países puedan adoptar como bloque en las próximas reuniones del Protocolo de Bioseguridad. Finalmente es interesante notar que la secretaria técnica administrativa del CAS yace en el IICA, Instituto Interamericano de Cooperación en Agricultura, que desde hace muchos años promueve los transgénicos en la región. 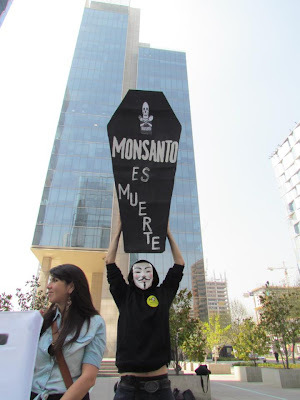 Mexico remains on high alert following the attempts of Monsanto and other agribusiness multinationals to win the government’s approval to plant 2.5 million hectares of transgenic maize in Mexico, the center of origin and diversity of maize. As ETC wrote last month, approval would allow the boldest coup of a global food crop in history and would threaten biodiversity, farmers’ rights and resilience in the face of climate change. While the outgoing government of Felipe Calderón did not approve the applications before leaving office on November 30th, its last-minute, surreptitious changes to regulatory procedures removed obstacles that could have hindered the new administration’s ability to grant the companies’ requests. Inside and outside Mexico, voices have decried the attack aimed at the heart of Mexican cultures, food, health and nature. Since mid-November, there have been workshops and public meetings, as well as petitions and protests by farmers, artists, activists and scientists in social and print media and on the radio. 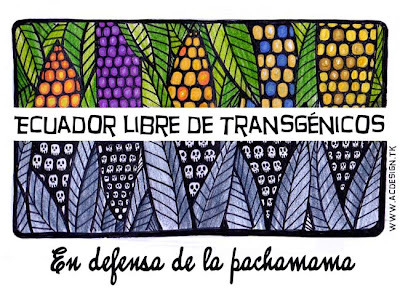 La Via Campesina, Grain and ETC Group wrote an open letter to the UN’s Food and Agricultural Organization (FAO) and Convention on Biological Diversity (CBD) asking the multilateral agencies to intervene for the sake of global food security. As Greenpeace reported at the end of November, the Mexican government quietly changed its regulatory procedures so that the Secretary of the Environment and Natural Resources (Semarnat) is no longer legally bound to take into account the advice of its own and other government agencies’ experts on biosafety. Three government bodies had made critical, extremely cautionary or explicitly negative recommendations when previously consulted about the release of GM maize in Mexico. Up until the Calderón administration’s parting shot, approvals to release GM crops were granted by the Secretary of Agriculture (Sagarpa) in agreement with the Secretary of Environment and Natural Resources, with a binding (vinculante) obligation to follow the recommendations of the National Institute of Ecology (INE), the National Commission for the Knowledge and Use of Biodiversity (Conabio) and, when applicable, the National Commission of Natural Protected Areas (Conanp). The Calderón government did away with the obligation to follow the recommendations of the three institutions, and the reference to the National Institute of Ecology (INE) was deleted altogether. 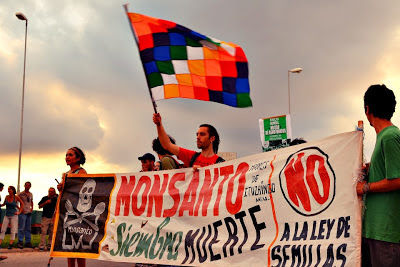 The Mexican National Commission for the Knowledge and Use of Biodiversity (Conabio) had recommended the companies’ applications be rejected on the basis of the risks to biodiversity and because it considered coexistence of peasant varieties with GM maize an impossibility. In 2009, Conabio published a study on the origin and diversification of maize, and subsequently began a project involving 235 experts from 70 institutions,which concluded that the whole Mexican territory is the center of origin of maize. This contradicts the conclusions conjured by the Mexican government in its map published in October 2012, which designated some areas in several states of Mexico outside the center of origin – the areas include those where the multinationals have asked to plant GM maize. After the government of Enrique Peña Nieto took office on December 1st, the new Secretary of Environment, Juan José Guerra, was quick to declare that he didn’t know enough about GMOs to give an opinion on the controversial issue, but stated it was a “technical decision” and he would consult scientists. While it is absurd to constrain the issue of maize in Mexico to the “technical” realm, there are ample reasons to deny the applications on technical grounds, many of which are as cited in the November 26 letter from the Union of Concerned Scientists (UCCS) to the Mexican government, signed by more than 2700 scientists and other experts, including two Nobel laureates and dozens of national science award winners. The UCCS letter requests that the government immediately reinstate the moratorium against GM maize and cancel all experimental trials as well. 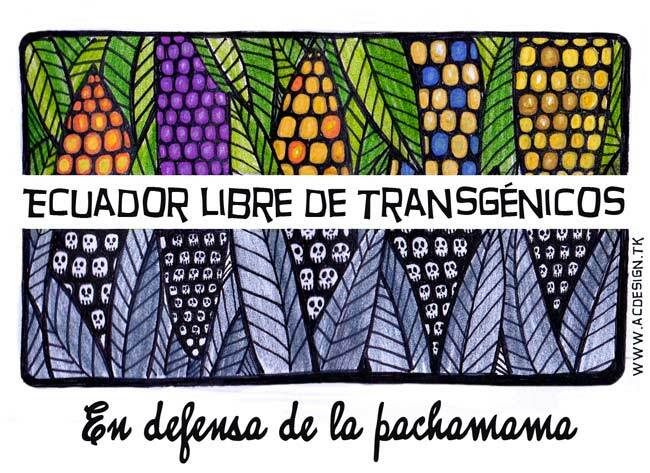 On December 7th, a broad coalition of urban and rural organizations demonstrated against GM maize outside the Secretary of Agriculture (Sagarpa). Mazahua indigenous women and urban grassroots organizations made tortillas in the street, with Mexican farmers, indigenous peoples and civil society organizations affirming their resistance to transgenic maize and the attempted coup by transnational companies. Delegates from all the organizations met with biosafety authorities of the Secretary to discuss the situation they consider “a national emergency.” They called for an open debate on GM maize to take place as soon as possible, with the understanding that the government not allow planting of GM maize in the meantime. On the same day as the demonstration in Mexico City, civil society organizations in Germany demonstrated their solidarity in front of Mexico’s embassy in Berlin. The United Nations and the world’s governments are standing by while the creators of maize are threatened by a government administration that has the power to unilaterally and irrevocably undermine global food security and 7,000 years of peasant maize breeding. 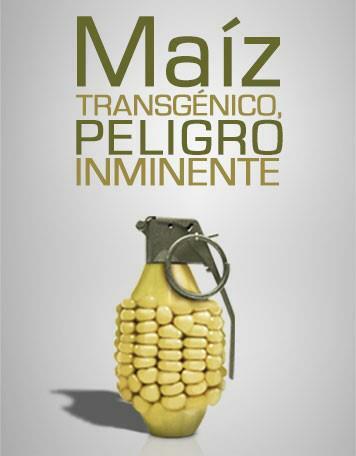 If Mexico’s government allows the commercial planting of GM maize, the precedent will have been set for centers of origin and diversity of food crops to be plundered and for the temporal territorial priorities of one administration to prevail over the human Right to Food. The official list of commercial applications for environmental release of GMOs is available here: http://www.senasica.gob.mx/?id=4443. The applications for commercial GM maize release are in numbers 61, 62, 79, 80, 81, 82 from year 2012. Greenpeace Mexico, “Semarnat modifica reglamento para allanar camino a transgénicos,” press release, 29 November 2012, available online:http://www.greenpeace.org/mexico/es/Prensa1/2012/Noviembre/Semarnat-modifica-reglamento-para-allanar-camino-a-transgenicos/. Kato, T.A. et al., “Origen y diversificación del maíz: una revisión analítica,” Universidad Nacional Autónoma de México, Comisión Nacional para el Conocimiento y Uso de la Biodiversidad, México, 2009, available online:http://www.biodiversidad.gob.mx/genes/pdf/Origen%20del%20MaizUv.pdf. National Commission for Biodiversity, Project Centers of Origin and diversification, available online:http://www.biodiversidad.gob.mx/v_ingles/genes/centers_origin/centers_origin.html. Enciso, A. “Para decidir sobre maíz transgénico, reunión intersecretarial…” La Jornada, México, 6 December 2012, available online:http://www.jornada.unam.mx/2012/12/06/politica/017n1pol. See also, UCCS, European Network of Scientists for Social and Environmental Responsibility (ENSSER), International Network of Engineers and Scientists for Global Responsibility (INES), Third World Network and Grain, “GM Maize in Mexico: An irreversible path away from agricultural biodiversity, farmer livelihoods and the right to food within the center of origin of maize,” November 2012, available online:http://www.ensser.org/developing-responsible-approaches-to-risk-assessment/gm-maize-in-mexico/. The demonstration was called by the Asamblea Nacional de Afectados Ambientales, Red en Defensa del Maíz, Movimiento Urbano Popular, Jóvenes ante la Emergencia Nacional, Movimiento Yo soy 132 and Unión Popular Revolucionaria Emiliano Zapata (UPREZ). See the original statement by the 8th Assembly of Environmental Affected in November 2012: http://redendefensadelmaiz.net/2012/11/pronunciamiento-emergencia-nacional-maiz-transgenico-a-punto-de-envenenar-nuestras-mesas-2/. See http://www.emergenciamaiz.org/ with photos and the declaration in English. 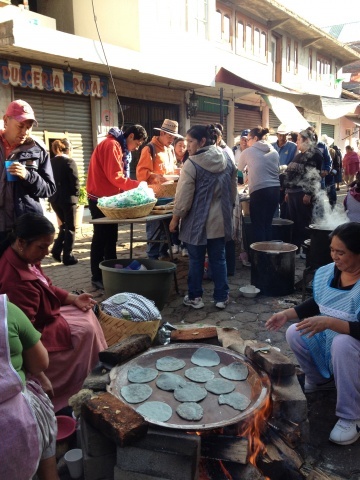 The poor in Latin America, but also in Asia and Africa, depend on breeding from maize diversity to support their subsistence and to help them cope with impacts of climate change. "Gran parte del maíz transgénico que Monsanto y otras empresas presionan para plantar en millones de hectáreas en México, es el tipo que provocó cáncer y otros daños a la salud (hígado y riñones, infertilidad, muerte prematura) en ratas de laboratorio, según un reciente estudio científico en Francia. El estudio ha sido objeto de muchos reconocimientos científicos y también cuestionamientos. Pese a que las críticas vienen de científicos ligados a la industria transgénica, es muy saludable que se discuta este y cualquier otro experimento científico. Lo que es enfermo y no se justifica en ningún escenario es que mientras tanto, se autorice la siembra y consumo de maíz transgénico, sometiendo a la población a esos riesgos." Current debates on seed center around its appropriation and privatization through intellectual property laws and treaties, and around the growing power of corporations like Monsanto and Syngenta, which are bent on creating virtual monopolies over all seed germplasm. Puerto Rican journalist Carmelo Ruiz-Marrero directs the Puerto Rico Project on Biosafety. He is also a Research Associate of the Institute for Social Ecology, a fellow of the Environmental Leadership Program, and a senior fellow of the Society of Environmental Journalists. He writes specially for the Fife Diet. Agriculture is humankind’s most important activity. According to some estimates, some 70% of the water our species uses goes to crops and farm animals, and agriculture takes up more space than any other human activity- just look at Google images of the Earth’s surface. According to the United Nations Food and Agriculture Organization (FAO), agriculture employs at least half of the world’s workforce, which makes it evident that no economic sector will ever create as many jobs as farming does. 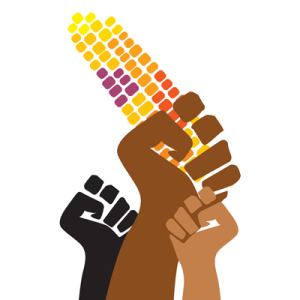 Agriculture therefore must be at the very center of any project for revolutionary social change. The green revolution failed. After decades of relentless work, world hunger has not been ameliorated. The world does not have less hungry people today, but more. Considering the vast human and financial resources that went into this endeavor, it is no exaggeration to state that the green revolution was one of the biggest failures of the twentieth century. In spite of its painfully obvious failure, the green revolution’s protagonists and spokespeople stubbornly refer to it as a success, that it was one of the most noble and successful humanitarian undertakings of all time. In light of the persistence of this triumphalist discourse, one can also say that the green revolution was also one of the major deceptions of the last century. The green revolution has been under continuous and unending criticism ever since it started. In the early 1960′s authors Rachel Carson and Murray Bookchin warned about the environmental and human health hazards of pesticides, one of the main elements of the green revolution. In the following decade, American activists Frances Moore Lappe and Joseph Collins founded the non-governmental organization Food First, which has produced educational materials on food, agriculture and hunger, with an explicitly critical view on the green revolution and neoliberal policies. In 1977 Lappe and Collins, with the collaboration of Cary Fowler, wrote “Food First: Beyond the Myth of Scarcity”. This pioneering book made a bold frontal attack on every assumption of the green revolution, from Malthusianism to the need for pesticides in agriculture. In 1981 Food First published “Circle of Poison”, a book about the hazards of pesticides, which led to the founding of the Pesticide Action Network, a global network that today comprises over 600 non-governmental organizations, institutions and individuals in 90 countries. Among the most important critiques of green revolution agriculture and supporters of organic farming are the pioneering research work done by Fowler and Mooney, the educational work of GRAIN, University of California agroecologist Miguel Altieri, Cuban scientist Fernando Funes, Puerto Rican professor Ivette Perfecto, Indian ecofeminist Vandana Shiva, and a growing number of small farmers’ organizations in both North and South, grouped together as Via Campesina, possibly the most important civil society organization in the world today. ...a new green revolution has been taking place since the 1990′s. There are several important differences between the old and new green revolutions. The first green revolution was founded on hybrid seeds that were the product of conventional breeding, while the new green revolution is based on genetically engineered seeds- which is why this new revolution is often referred to as the gene revolution. The seeds of the first green revolution were freely distributed, while the seeds of the gene revolution are patented. The first green revolution was not some evil plot to take over world agriculture- its protagonists really intended to put an end to world hunger, and fully believed such a goal could be achieved within their lifetimes. Their agricultural revolution was driven by a conflicted mix of idealism, pragmatism, cold war geopolitics, and a sincere belief in the promise of modernity and secular salvation through scientific progress. 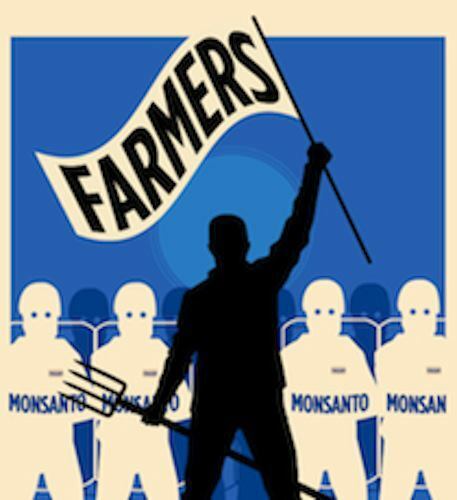 But the new green revolution is motivated solely by greed and profit, nothing else. The first green revolution was carried out by the public sector and philanthropic private foundations, while the gene revolution is exclusively the product of a half dozen transnational corporations that dominate the so-called “life sciences”, of which the undisputed leader is Monsanto. To this we must add the arrival of a new actor on the scene, the Bill and Melinda Gates Foundation, which is channeling enormous sums of money into agricultural research in the global South, especially in Africa. The new green revolution does not take place in opposition to the previous one. On the contrary, it aims to complement it and extend it, and the institutions of both frequently work together. The most prominent example of this collaboration is the Alliance for a Green Revolution in Africa, a joint venture of the Gates and Rockefeller foundations. The institutions of the old green revolution are still around and continue doing their work, but nowadays with less financing and support than in the previous century. They are undergoing a funding crisis, as are all public agricultural research programs worldwide, as neoliberal governments have declared open season on public funding for scientific research and agricultural science. In response, these institutions are forming public-private partnerships with biotechnology corporations. These arrangements are not exempt of controversy. Critics have pointed out that they can lead to the patenting of seed collections and the abandonment of research and development of conventional seed in favor of genetically engineered varieties. Una veintena de organizaciones sociales y campesinas piden en un comunicado dirigido al Dr. César Paz y Miño que exista un debate claro y transparente en torno a los transgénicos. El grupo aclara algunos puntos, que según ellos, son clave al momento de hablar de Organismos Genéticamente Modificados (OGMs). El comunicado indica que el modelo agrícola que se impone con los transgénicos no beneficia a los campesinos pues merma la capacidad de producción de los campos, pone en riesgo los cultivos al exponerlos a la posibilidad de sufrir contaminación genética e impide el libre intercambio de semillas entre campesinos, forzando la compra de semillas patentadas. En la misma línea se aclara que el negocio de los medicamentos transgénicos como la insulina, no beneficia directamente a los consumidores, ya que no se reducen los costos de venta al público, sino que se reducen los costos de producción en beneficio de las empresas farmacéuticas. Finalmente, las organizaciones que firman la carta señalan que el fortalecimiento en la agricultura en el Ecuador sería un mecanismo efectivo para consolidar un modelo de producción agroecológico que beneficie tanto a los campesinos y sus familias, como a los consumidores en las ciudades. Las bombas desde mar y aire llueven de nuevo sobre Gaza. Mueren ancianos, niñas y niños, mujeres y hombres. Estados Unidos apoya abiertamente a Israel en el uso de la fuerza militar mientras el resto de países apenas susurran. El poeta, atento, toma la palabra: “Quemad nuestra tierra, quemad nuestros sueños, verted ácido en nuestras canciones. Cubrid con serrín la sangre de los nuestros, asesinados”. Mientras tanto en la comunidad de Simbol, en Santiago del Estero, Argentina, lloran el asesinato del compañero campesino Miguel Galván a manos de sicarios del agronegocio de la soja transgénica que avanza desvistiendo bosques y selvas, borrando pueblos como una plaga bíblica de langostas. Miguel en el campo cuidaba la tierra, defendía la vida. El poeta sostiene su canto: Arrasad con vuestras bombas los valles, borrad con vuestros editores nuestro pasado, nuestra literatura; nuestra metáfora. Desnudad los bosques y la tierra, hasta que ni el insecto, ni el ave, ni la palabra encuentren rincón alguno donde refugiarse . Los mismísimos mercenarios de los agronegocios quieren aprobar en los próximos días la siembra masiva de maíz transgénico en México. Si les dejamos, escupirán a la tierra sus ansias de lucro, sembrando la muerte en las tierras que dieron origen a este grano hecho de barro y pasto, en reunión de dioses y humanos. Informado, el poeta levanta más alto, más lejos, su voz. Ahogad con vuestra tecnología el clamor de todo lo que es libre, salvaje e indígena. Destruid. Destruid. Nuestra historia y nuestro suelo. Asolad alquerías y aldeas que nuestros mayores construyeron. Los árboles, las casas, los libros, y las leyes y toda la equidad y la armonía . Alertados los pueblos indígenas, rurales, urbanos, de México y de todo el mundo, se acercan, se aprietan, y cada uno como un grano se ensamblan formando una nueva comunidad, una mazorca que asemeja un puño levantado, para detener la barbaridad de la siembra de ese maíz empeorado, contaminador, uniforme, enfermizo, estéril y criminal. Y escuchan los Pueblos-Mazorca el canto del poeta palestino campesino y anónimo:“Haced eso y aún más. No tengo miedo a la tiranía. No desespero nunca y es que guardo una semilla, una semilla pequeña pero viva, que voy a guardar con cuidado, y a plantar de nuevo”. La esperanza –como el maíz criollo– siempre se puede sembrar. It’s a fish... it’s a car... wait! It’s a Fishycorn car? 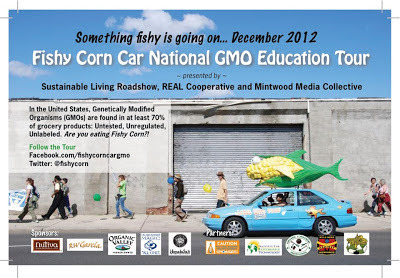 The Sustainable Living Roadshow and REAL Cooperative are traveling from California to Washington DC to promote education and awareness about genetically modified foods and the importance of GMO labeling and testing in the United States. 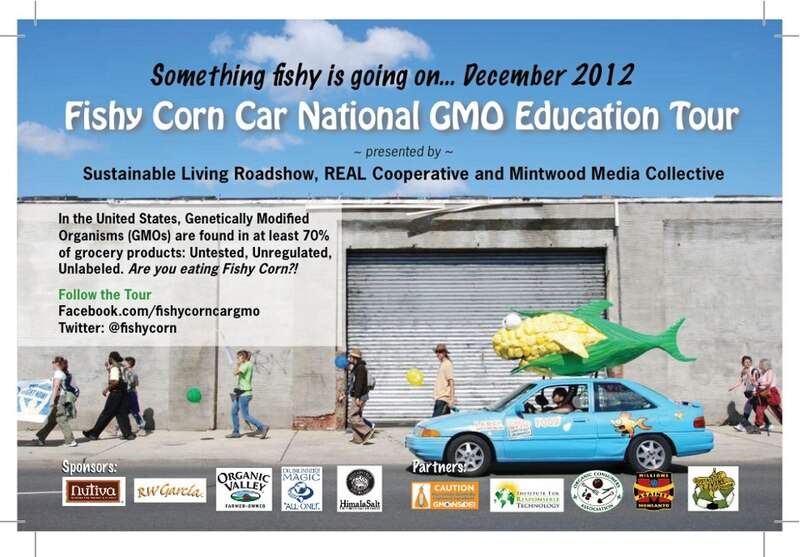 What better way to attract attention and get out the word than by driving Fishycorn, the giant cornfish car? Was the Prop 37 Election Stolen? The most recent official vote tally released from the California's Secretary of State office on Dec. 3 claims that Prop 37, the California Right to Know Genetically Engineered Food Act, was defeated by a narrow margin of 51.5%-48.5%. Or was it? Statisticians in California have uncovered a series of near-impossible "statistical abnormalities" affecting over 150,000 votes that could have swung the election. Their research strongly suggests that electronic vote tabulators in a number of California counties switched Yes on 37 votes into No votes. Statisticians found that Yes on 37 fared worse, on the average, in larger precincts in a number of California's most populous counties than it did in smaller precincts. These findings fly in the face of polls and common sense, given that the strongest support for Yes on 37 came from young people, younger moms, minority communities and low-income residents who are concentrated in these same larger urban precincts. On Dec. 10, a donor to OCA and the Yes on Prop 37 campaign filed an official request for a recount in Orange and numerous other counties in California. OCA supports this recount request and will keep you informed on the results of the recount. We will not be satisfied by the "official" Prop 37 election results issued by the Secretary of State's office until there is a complete recount of the votes in all the counties exhibiting statistical abnormalities. 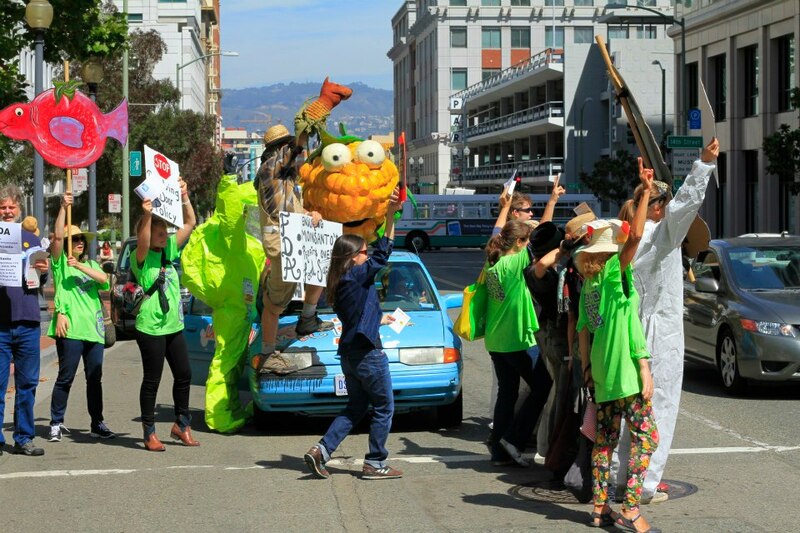 We've already reported extensively on the lengths Big Biotech and Big Food went to defeat Prop 37. On how they spent $46 million on non-stop ads full of lies and misinformation, and on false mailers pretending to originate from the Democratic Party. Were they desperate enough to flip enough votes to ensure their narrow victory? We hope a recount will shed more light on this. For an overview of how electronic "vote flipping" may have stolen the Prop 37 Ballot Initiative, you can listen to this one-hour, in-depth radio show hosted by Bob Fitrakis, Ohio political science professor and expert on electronic voter theft. Among his guests are Francois Choquette, respected California statistician who is investigating electronic voter fraud on Prop 37. The battle for safe food is not over, despite the defeat in California. 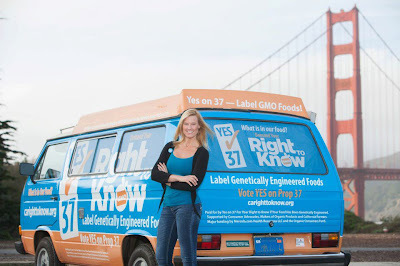 California's Proposition 37, which would have made it mandatory to label foods containing ingredients from genetically modified organisms (GMOs), was narrowly defeated on Nov. 6 as a result of a $46 million fear-mongering propaganda campaign funded mainly by the biotechnology and food-processing industries. These engineered foods have never been demonstrated to be necessary or safe, and scientific studies not funded by industry consistently find in them safety problems with serious implications for human health. That's why they are essentially banned in the European Union. 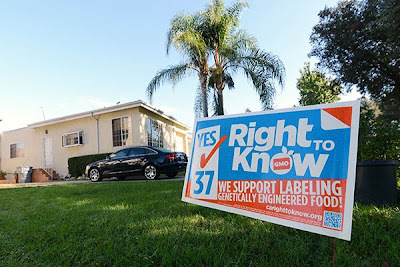 Some argued that the California measure was unnecessary because organic GMO-free foods are labeled as such, and therefore consumers can simply choose to buy those. But such a libertarian argument falls from its own weight, given that polls show that the great majority of U.S. consumers are unaware that there are vast amounts of GMO foods out there. Surveys show that Americans would avoid GMO foods if these were labeled. 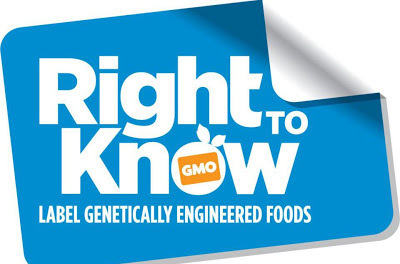 An ABC News poll showed that 93 percent of Americans want GMO foods labeled. But Monsanto, DuPont, Pepsi and Kellogg scared a small majority of voters into falsely believing that labeling genetically modified products would raise food prices. Big Food and Big Biotech are celebrating their California victory, but the fight is not over - not by a long shot. Even as Proposition 37 was being defeated on Nov. 6, the voters of Washington state's San Juan County voted to prohibit the planting of GMO crops. And unfazed by the defeat in California, Washington residents are now busy gathering the 320,000 required signatures for a statewide referendum on GMO labeling. 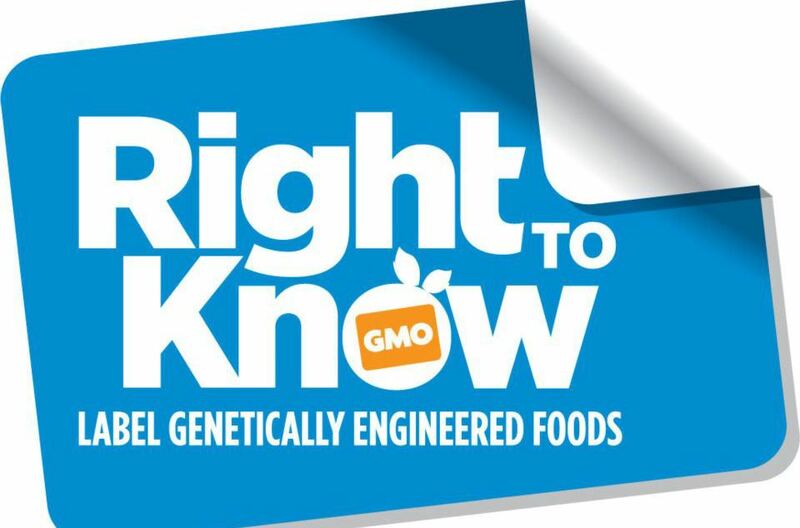 Additionally, consumer rights groups are working for labeling in 30 states and have united as the Coalition of States for Mandatory GMO Labeling. At the national level, a petition to Congress demanding the countrywide labeling of GMOs has received more than 52,000 signatures. A similar petition by http://JustLabelit.org addressed to the Food and Drug Administration has more than 1.2 million signatories. As more and more Americans become concerned about what's in their food, the popular demand for labeling genetically modified organisms will only grow louder. Carmelo Ruiz-Marrerois a Puerto Rican author, journalist and environmental educator. Readers may write to the author at: Progressive Media Project, 409 East Main Street, Madison, Wis. 53703; email: pmproj@progressive.org; Web site: www.progressive.org. For information on PMP's funding, please visit http://www.progressive.org/pmpabout.html#anchorsupport. 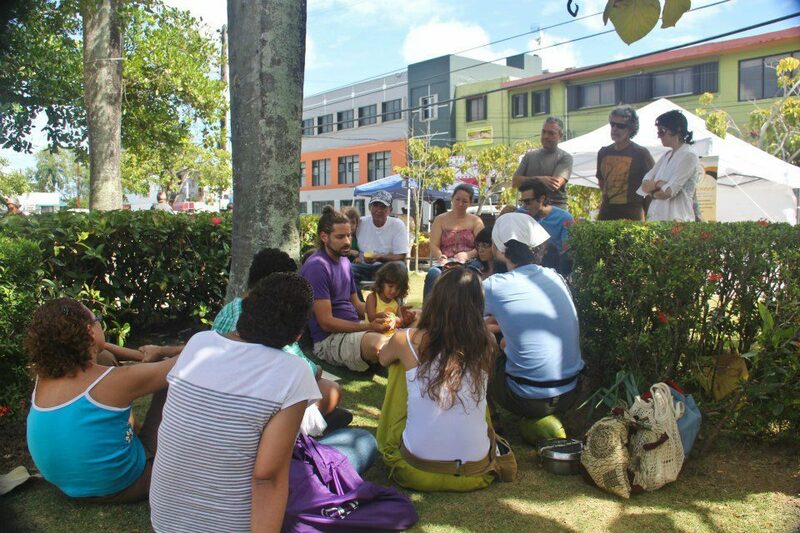 En Puerto Rico las actividades de Semillas de Libertad fueron coordinadas por la Organización Boricuá de Agricultura Eco-Orgánica, un grupo de agricultores que promueve la visión y práctica agroecológica desde su fundación en 1989. Varias otras agrupaciones aportaron, incluyendo el Proyecto de Bioseguridad de Puerto Rico, Slow Food Boricua, y la Cooperativa Orgánica Madre Tierra.